On Sunday, the team started unpacking and began to set up equipment donated by generous companies in Australia. 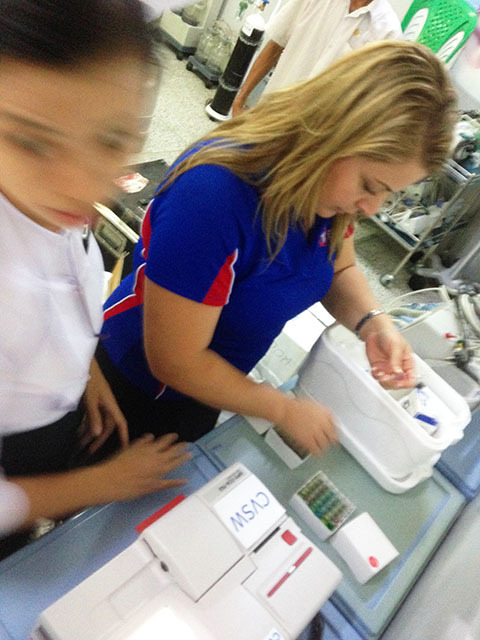 It’s a big feat to organise all these supplies coming from all over Australia, let alone having them delivered to the right Hospital, and then to the right place, on time, in Yangon. Just imagine the fun you would have looking for the specialised ‘bits’ you require. Perhaps they are somewhere in all those boxes. You have a limited time before the theatre procedures really start happening! And if what you are looking for, you can’t find, don’t panic, because they are probably in another room, or even misplaced at one of the other hospitals on the other side of town… Pathology team member, Catia Da Costa-Wooler (below) is setting up an arterial blood gas machine in the Intensive Care Unit at the Yankin Paediatric Hospital…hope she has everything she needs!